Please note that our Suede Bag Program is only for customers that purchase our bulk rock products. The suede bags are sold at a very low price as an incentive and our profit margin is very low for this item. Orders placed for only suede bags will not be accepted. 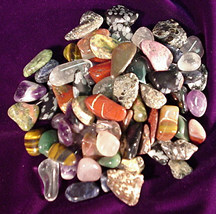 Our Bulk Tumbled Gemstone Mix is one of our best selling items! 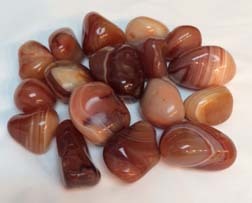 It's a bright and attractive blend of natural and dyed tumbled stone sold in 25 pound bags. You can sell this product by the bag (see our Suede Drawstring Bag page) or by the single stone. Don't forget to purchase your Natures Treasure Information Cards for stone recognition! Sizes range from 3/4" to 1" typically but can go 1.25". Sold in packs of 100 each at $.10 ea. Printed 3.5"x5.5" card with educational information on almost every stone found in our gemstone mix. Kids of all ages can identify the stones they have chosen and mark them off the card. Suede Drawstring Bag 2" x 3". Great for holding your customers' treasures! 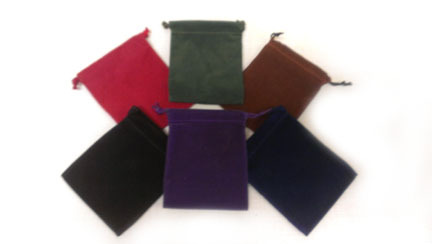 2"x3" bag available in Blue, Brown, Purple, Green, and Red. ORDER BY 100 PIECE LOTS (bags of 100ea). Perfect for filling with our Bulk Gem Mix or other bulk items!!. Price is $.45 each, sold in bags of 100 each. Suede drawstring bag 3" x 4". Sell alone or with your bagged tumbled stone displays. Available in Black, Red, Blue, Green, and Purple. Perfect for filling with our Bulk Gem Mix or other bulk items!! Sold by each. NEW ADDITION TO OUR PEBBLE COLLECTION! Prices range from $1.00 to $5.00 each. Price is $18.00 per pound, sold in 1 pound bags. 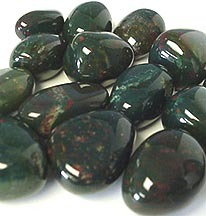 Bloodstone Tumbles Stone is a medium sized polished tumbled stone and is approx. 3/4". Price is $7.00 a pound, sold in 2.5 pound bags. 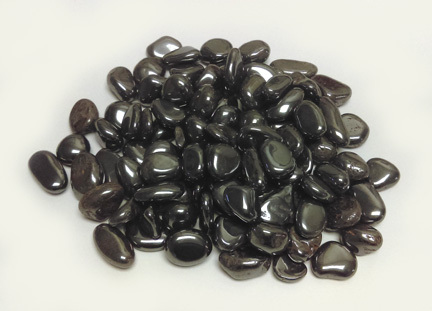 Our Hematite Tumbled Stone is available in two sizes and come in 2.5 lb. bags. Medium stones are approx 1/2" to 3/4" and Large stones are approx. 1". Price is $6.50 pound, sold in 2.5 pound bags. Our Natural Gemstone Mix Tumbled Stone is a blend of all natural stones. This mix includes stones like Amethyst, Quartz, Rose Quartz, Sodalite, Poppy Jasper, Picture Jasper, Tiger Eye, Snowflake Obsidian, Unakite and many more. 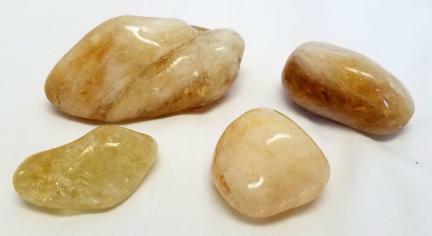 Medium stones are 3/4" and Large are 1". Price is .60 each, sold in bags of 100 pieces. 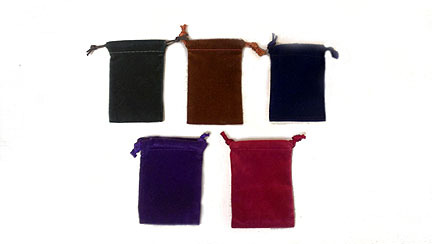 Suede Drawstring Bag 3.5" x 5". Great for holding your customers' treasures! This 3.5" x 5" bag is available in assorted only. Deep, rich colors include: brown, dark blue, forest green, and red. Price is $21.00 pound, sold in 1 pound bags. Available in 1 lb increments. 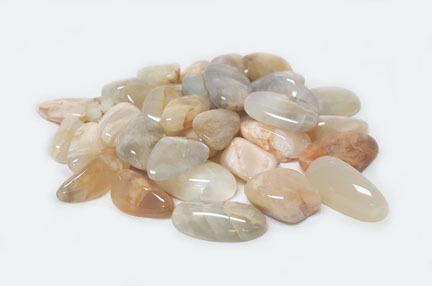 Moonstone Tumbled Stone is a medium sized stone and is approx. 3/4". Stone colors can range from white, pale yellow, peach, tan, to a reddish brown. Metaphysically, Moonstone has a very nourishing, sensual, deeply feminine energy that knows how to heal and bring you back to wholeness. It is the stone of the mother moon, deep healing waters, and sacred feminine energies. Price is $8.50 per pound, sold in 2.5 pound bags. NEW PRODUCT!!! Unakite Jasper is a metamorphic rock that forms when granite is altered by hydrothermal activity. During this change, plagioclase in the granite is replaced by epidote to produce a rock composed primarily of green epidote, pink orthoclase, and clear to bluish-gray quartz. Overflowing with metaphysical properties, Unakite Jasper brings together the abundant, nurturing energy of green with the soft, caring passion of pink in one of nature’s most healing crystals of the heart and mind. It resonates with the frequency of love, compassion, and kindness, and is a stone dedicated to balancing the emotional body. 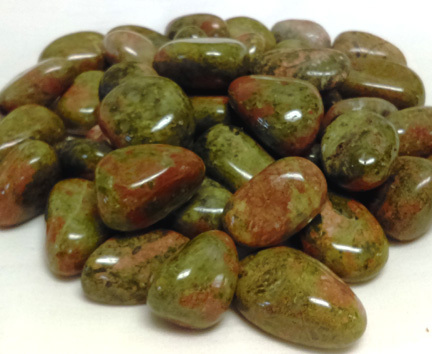 Unakite Tumbled Stone is available in two sizes. Medium sized stones are approx 0.75" and Large are approx 1". Use Lepidolite to reduce stress associated with change. 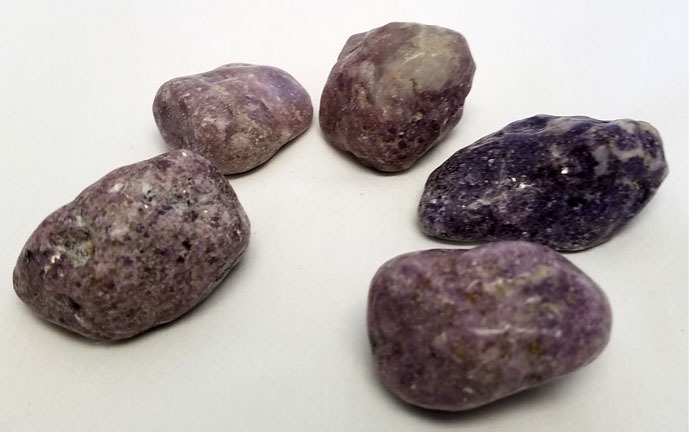 Lepidolite brings balance and inner peace, helping one to see reasons behind any negative experiences, so they can improve on them. Price is $4.50 pound, sold in 11 pound(5 kilogram) bags. This 1/4" - 1/2" Super Mini Natural Tumbled Stone from Brazil is good for mining pan operations and craft projects. Price is $13.00 pound, sold in 1 pound bags. 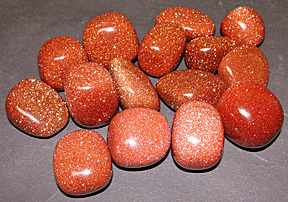 Goldstone Tumbled Stone is medium sized polished tumbled stone and is approximately 3/4" in size. It is sold in 1 pound increments. Price is $6.00 a pound, sold in 2.5 pound bags. 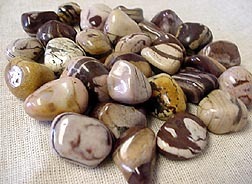 Zebra Jasper Tumbled Stone is available in two sizes. Sold in 2.5 lb. bags. Medium stones are approx 3/4" and large stones are approx. 1".